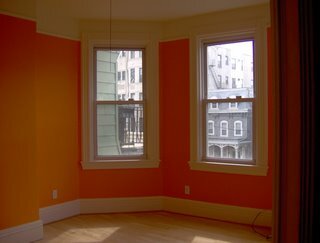 I saw this color (Sherwin Williams Laughing Orange) in a magazine, and showed it to Stephanie, saying that I thought it looked great. We'd been having this debate/discussion/frank exchange of differing opinions about the color of the house-- as I think Stephanie said previously, I have a fear that at the end the house will be very tastefully decorated and really really boring. Anyway, to make a long story short-- I badgered Stephanie until she agreed that I could paint the office whatever color I wanted. And I wanted Laughing Orange. Or so I thought! When the first test paint came in, it seemed MUCH brighter than in the magazine. And I had another fear-- one that said that perhaps I'd just squandered some serious bargaining chips on a color I wasn't going to like. Perhaps there was such a thing as "too bright"
Fortunately, that is not the case. 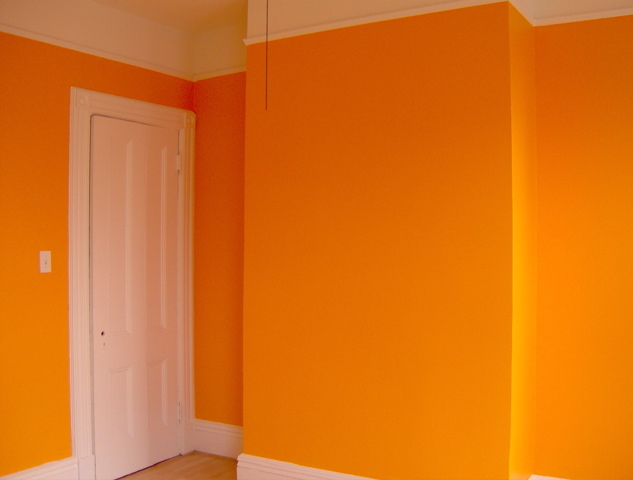 The room is bright and orange, but it really is quite nice and cheerful. I'm very happy with it, and I think Stephanie is too-- at least more than she expected to be. Score one for the clown. 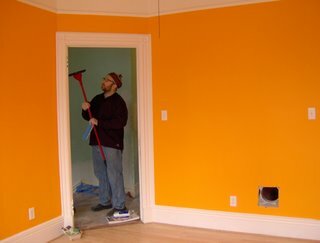 In the bad news department, this is the last room that will be painted by these guys. We are now searching for more painters. Want to know why? Here's the inside scoop. We live in an old house, with really nice molding-- molding that has been mistreated over the years-- painted, repainted, gouged out, painted again,etc. It's a fair amount of work and care and time to sand the moldings back to try to get them to an even state. We explained this to all of the painters, including the one we selected. And he seemed to completely get what was going on, and knew that we weren't expecting perfection, but we wanted him to take the time to get the moldings reasonably close. Comments on "Room A L'Orange"
Did a search of laughing orange/sherwin williams and had to chuckle reading your post. This is exactly what I did in my office and LOVE it! My productivity has soared and so has my at work attitude! LOVE IT! Congrats on your excellent office!